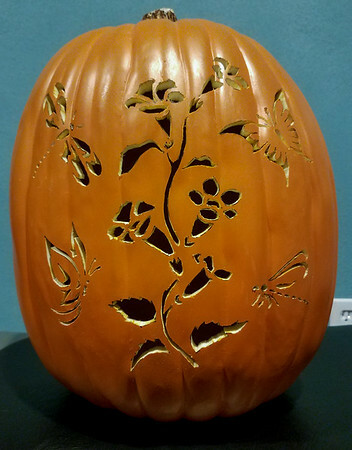 I wanted a companion piece to the carving I made the year before. The theme that year was Hummingbirds (link here). As with all my projects, it needs to be worth it if I am going to spend time on it. I was not able to find what I wanted on the Hummingbird project so opted to create my own from a number of composts procured from the web. This project went pretty much the same. 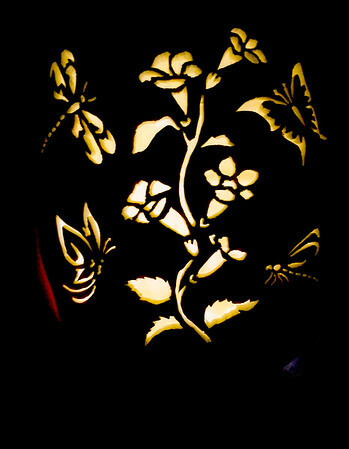 Halloween night I once again could not find any per-made templates requiring me to spend most of the night looking for pieces I could use. 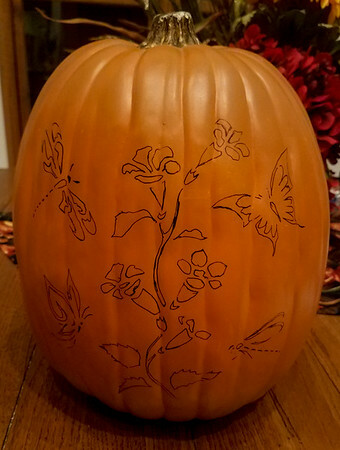 My go to source for pumpkin carving is tattoo images. After spending a significant amount of time and still not finding something that would complement the Hummingbird theme, I switched to my second favorite source – stencils. That was the basis for the Hummers. Eventually found a couple of Butters, a Dragon and likely a Damsel in the same style as the previous birds. Next up was to find the flower to use as the centerpiece. I must have spent 2+ hours trying to find an image that would fit the previous style, finally settling on a buttercup looking one. After another hour or so, I had everything arranged the way I wanted it and got it printed out. The next step is probably the most tedious of the project. In the past I have used carbon paper. 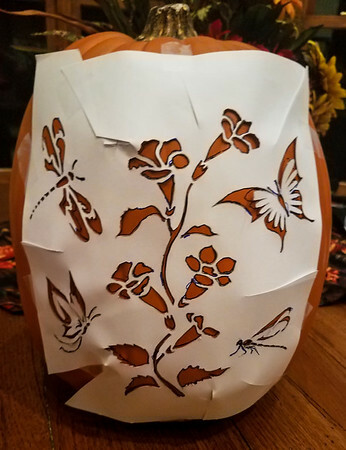 That worked okay, but ended up leaving the pumpkin covered in ink from other pressure point while trying to trace the lines. Gave up that approach and now take the time to cut out the template with an Exacto knife. Two benefits come out of this tedious work. The first is memory learning for the hands. Cutting out the pattern is very similar to cutting out the actual pumpkin giving me a chance to get comfortable with the cuts. The other benefit is a critical one – pattern validation. I’ve developed a keen eye over the years and can tell pretty quickly if a pattern is valid .. in other words, doesn’t have cuts which destroy the image. For example a solid piece that has a cut that goes all the way around it. I am always amazed at the number of false patterns that are out on the web. Photoshop jobs that are superimposed on pumpkins that give the illusion they were cut (I am not talking about half cuts). By cutting it out on paper first I can make sure it is error free. Once cut out, I attach it to the foam pumpkin. A gel pen is used to trace the cutouts onto the face. At this point it was very late and last year, Halloween fell on a weeknight. Sigh, it was definitely going to take a couple of hours to get this carved out. I put it on the shelf and promised myself I would come back to it as soon as I could. Well, that day was last weekend. Saw it sitting on my project table, felt a tinge of guilt leading to firing up the hot knife. About 2.5 hours later the pumpkin was adorned with the desired image. The hot knife was the main workhorse for this year’s effort. That tool works great for long edges. Tight areas is a different story. Basically a series of small slices to get enough of the foam removed to get in for the fine detail. In some cases it is just impossible without jeopardizing the integrity of the pattern. For those areas, I break out the cordless Mini Dremel. I use a thin vertical cutter from Craftsman that works really nice. With that I was able to finish out those tight spots. With the majority of the material removed, I was able to come back with the hot knife and clean up the edges. That took another 30 minutes to get it to my satisfaction. A final circle cut was made on the back of the pumpkin to insert the light bulb. Now that the cutting was done, I shook out all the waste material (some of the larger pieces have to be pulled out with a tweezer or needle nose pliers). Still better than having all that junk scattered over the floor – bad enough what does get all over my clothes. The light string was already put away for the season. Had to go with the standard fallback – LED flashlight. Point that into the hole, hit the lights and magic! Ended up being a lot of work. Worth it though – really happy with the end product. It will look nice next to the Hummers. Probably need to get back to the more traditional scary pumpkin themes or people will start accusing me of going soft on my favorite holiday. Hope you enjoyed the latest addition to my pumpkin collection. Note: This pattern is a composite of multiple images found on the web. The rights to the individual images remain with the creator of those patterns. 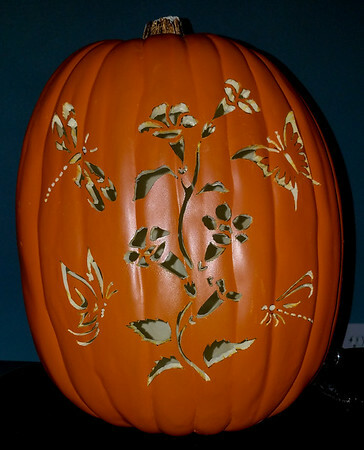 This is pumpkin is for personal use only – neither the composite pattern that was used for this carving nor the pumpkin itself are available for sale.